Throwing a birthday party, baby shower, graduation party or any other kind of event can get expensive quick! Your party decorations don’t have to be expensive though! 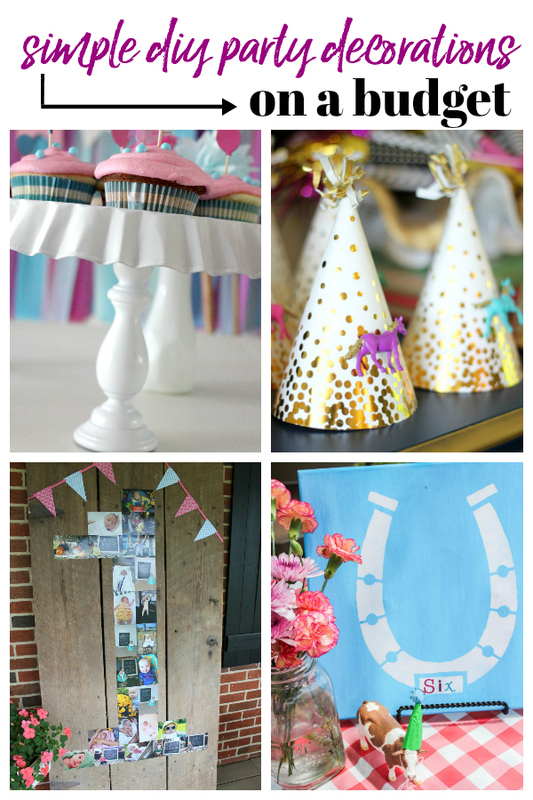 Use these easy party decoration ideas to create beautiful DIY party decorations custom fit to your event! Have’t made those party invitations yet? No worries! 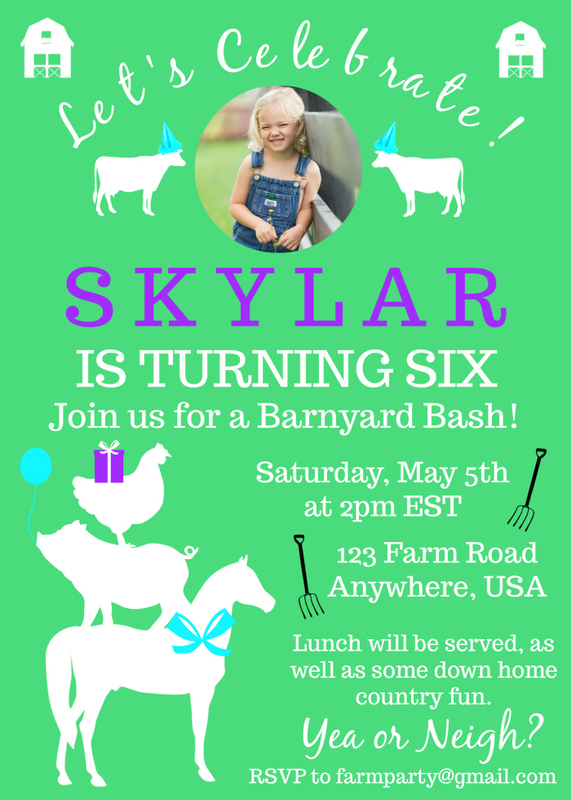 I’ve made all of the Circus’ party invitations using PicMonkey so that I can easily customize them to her and her party’s theme. 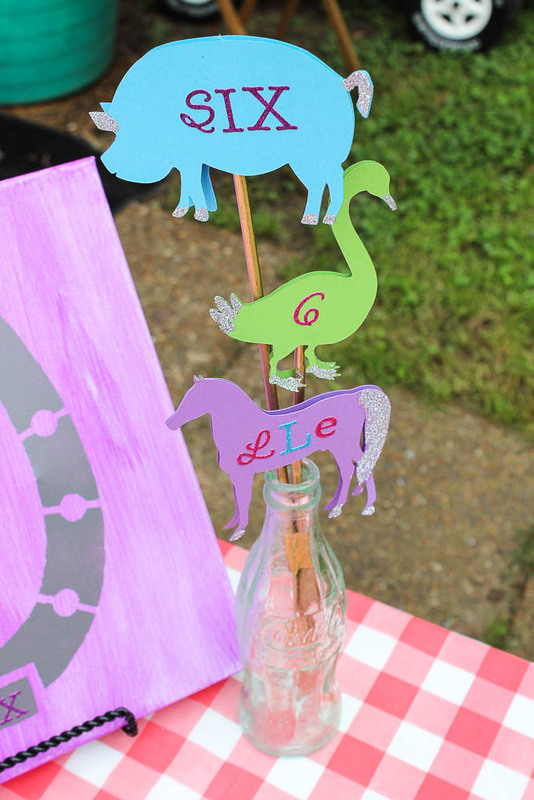 Use this tutorial for a basic party invitation and this one for making the farm themed one you see above. 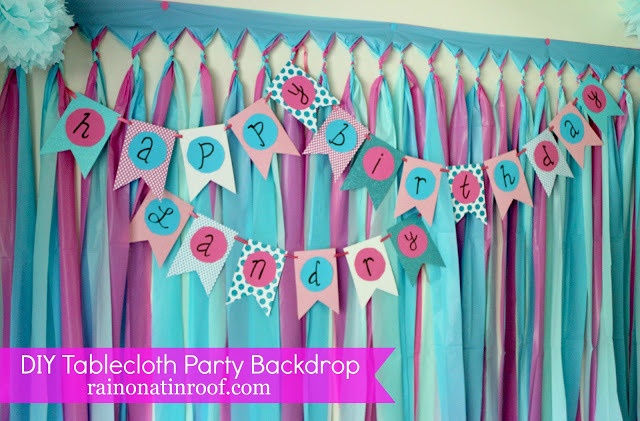 My most tried and true party decoration – a party backdrop made from plastic tablecloths. We’ve had one of these for four out of six of the Circus’ birthday parties and I’ve also made a couple of these for baby showers as well. These are the perfect focal point for your party. Place it behind your cake table, present table, or just leave it on an open wall to work as a photo backdrop too. 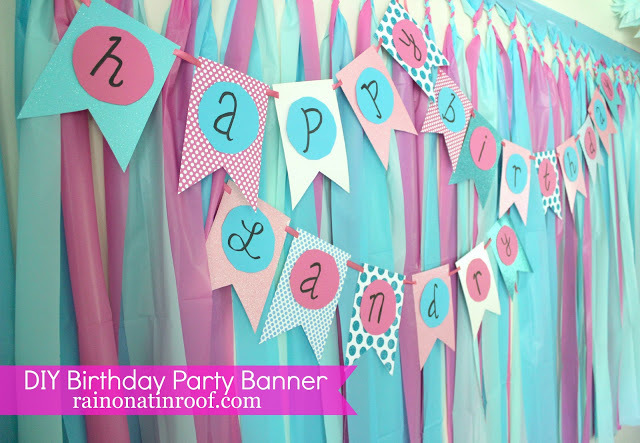 If you’re using a banner, it’s the perfect backdrop for your party banner too. This thing is so easy to make – all you’ll need are a few plastic tablecloths, scissors and table. Full tutorial for this one HERE! Speaking of party banners, this one is easy peasy to make. 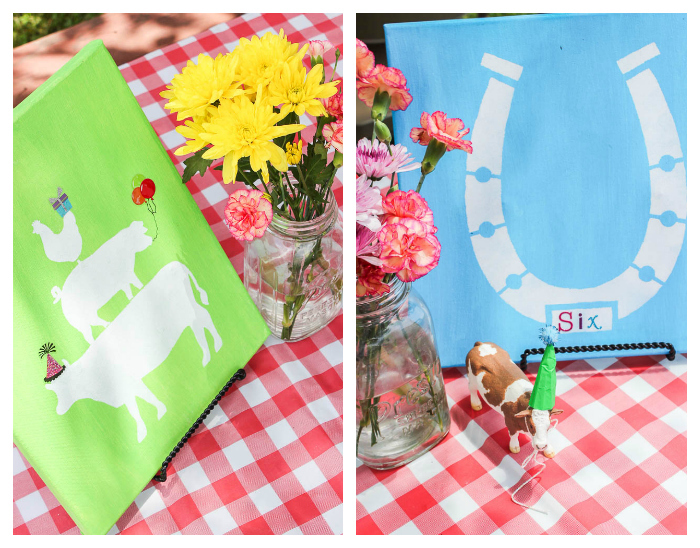 No fancy Silhouette or Cricut required – just trace and cut. 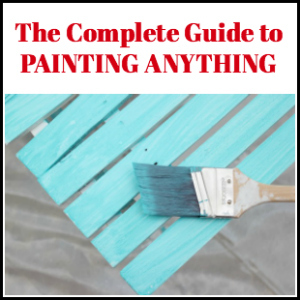 Find out how to make it here! I made this superhero style banner with Picmonkey. You can switch up the design to work with your party’s theme. 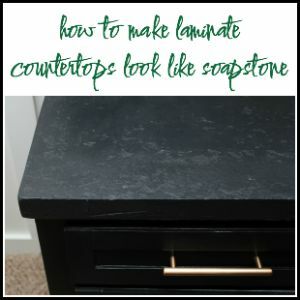 See how to make your own HERE! 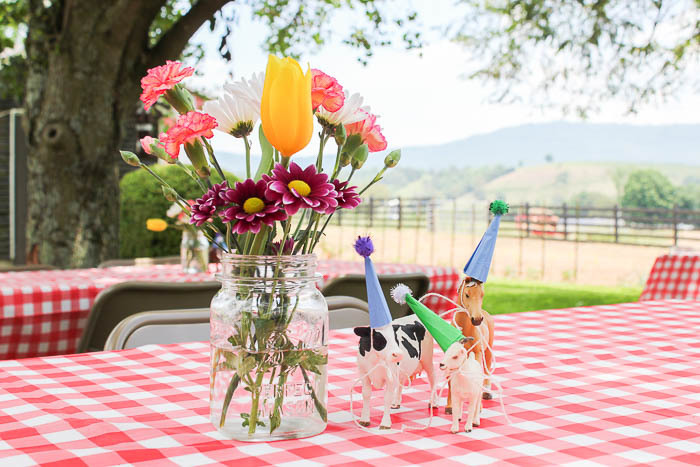 For the Circus’ farm party, I wanted simple, but pretty flower arrangements on each table. Premade, ready to go arrangements aren’t cheap. To keep things wallet friendly, I bought three different bouquets of three different kinds of flowers, then mixed them all up in mason jars for the tables. If some kind of animal works with your party theme, raid your kid’s toys for little plastic animals, then adorn them with mini party hats. 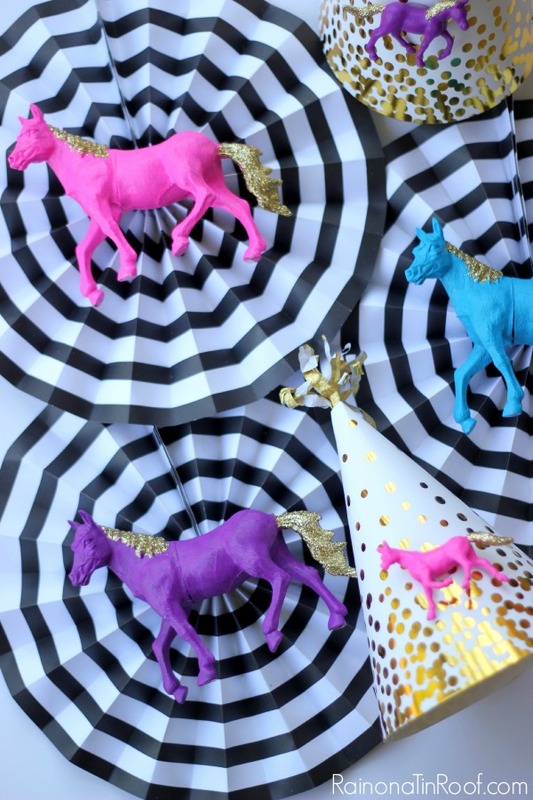 I borrowed farm animals from the Circus then topped each with mini party hats made from cupcake liners. 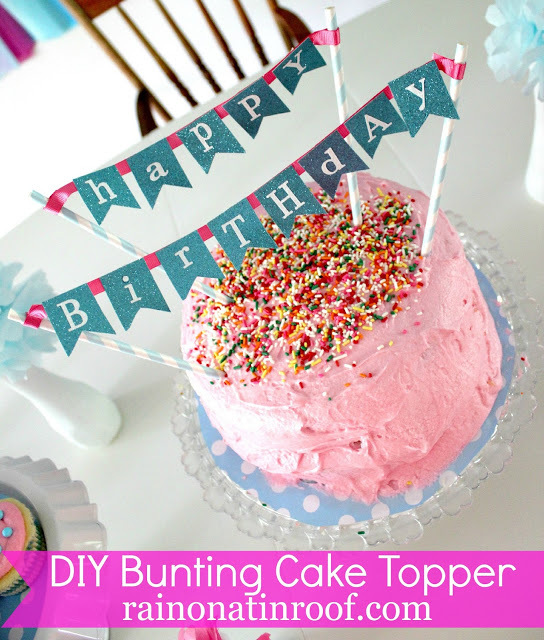 Cake toppers can add so much to a cake and the party decorations and they can be super easy to make! I did the one above for the Circus’ first birthday using just scrapbook paper, stickers, ribbon and straws! 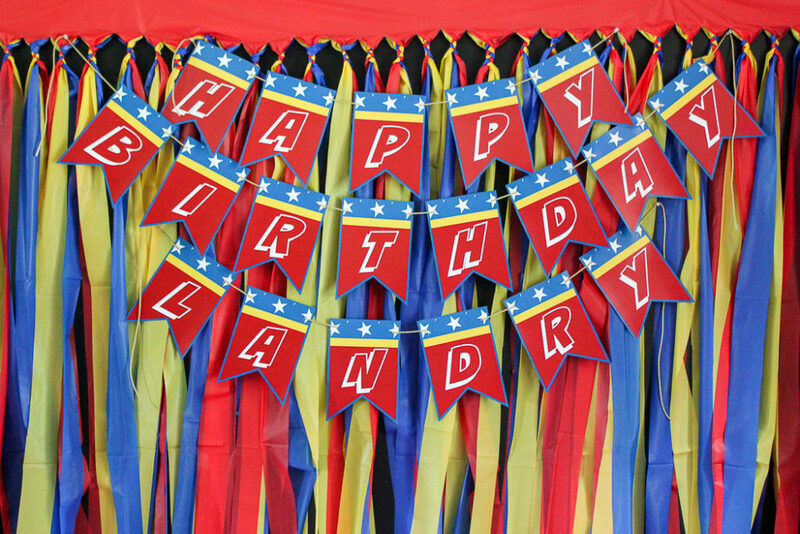 You can easily customize it with colors, patterns and wordage for your party. I did a similar one before for a wedding shower and used the couples monogram on the topper. Find out how to make it HERE. I made these cupcake holders using items from a thrift store and they added so much cuteness to the food table! I made mine white so that they can work with any party decor. The top has an inset that allows you to put a round piece of cardstock in, so that’s another place for you to add some color and decor! 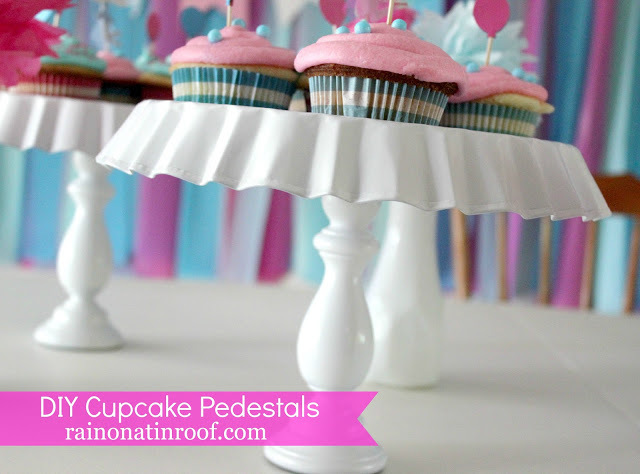 Find out how to make these cupcake pedestals HERE! This is one of those party decorations that everyone will love to spend some time looking at – a picture collage. If you’re doing this for a birthday party, obviously doing it with the birthday number is a no-brainer. 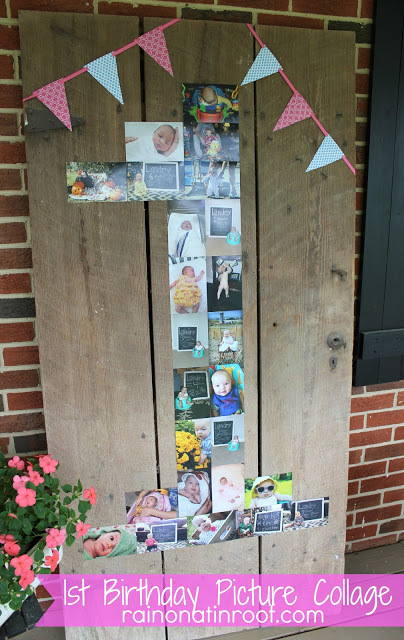 If you’re doing it for a wedding shower, use pictures of the couple both together and separate as they were growing up, then put the photos in the shape of what will be the initial of their last name. For graduation parties, select a picture or two from each year of the graduate’s school grades, then put them in the shape of their initial. More on how I did the one above is HERE! This will always be my most favorite party hat. 🙂 I made this using good ole’ scrapbook paper and yarn pom poms. Super easy. Super adorable. 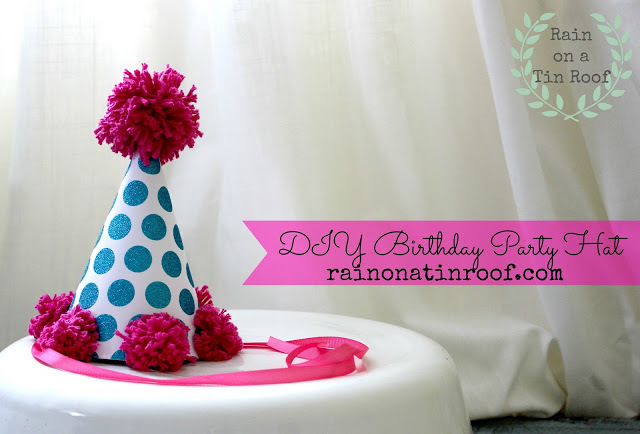 See how to make your own party hat HERE! A great way to save time, but still have custom party decorations is to embellish store bought decorations. I like to call these semi-homemade party decorations. 😉 For the ones you see above, I bought plastic horses at the Dollar Tree then painted them in bright colors and glittered their manes. Then, I just glued them on the store bought party hats and wall decorations. See more about it HERE! To decorate some of the tables at the Circus’ farm party, I made some simple stencil art that was customized for her party theme. We hung onto these afterwards and now they are hanging in her bedroom! Obviously, farm animals and horseshoes aren’t going to work for every party. 🙂 For things like wedding showers, do art with the couples’ monogram, initials, future wedding date, etc. For baby showers, ask the parents-to-be how they are decorating the nursery and make the art match the nursery so they can use it in there afterwards! Another great table decoration here – add height and personalization by making personalized cutouts relevant to your party theme. These were for the Circus’ birthday, so they have the birthday number on them and her initials. If you’re doing it for a wedding shower, make a bride and groom, rings or “I do!” cutouts. To make my cutouts, I bought a graphics file on Creative Market, then loaded them into my Silhouette to cut out. 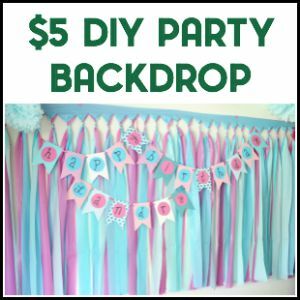 Any budget homemade party decorations you can add to this list? 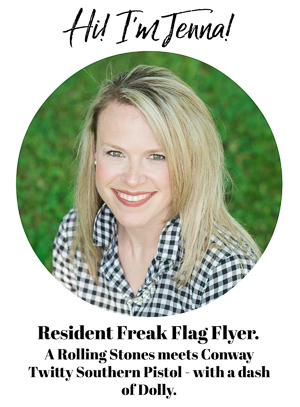 You really do always have the best party decorations and themes. These are all so fun and creative. Thanks so much, Marty! The kid is pretty helpful with coming up with ideas!! Jenna I love how creative you are with her bday celebrations. 20 years ago the internet was not quite what it is today and the creativity for my children’s bday parties had to come from my head for the most part….I can only imagine how much easier it would have been back then had I been able to use blogs and pinterest to do my research! But I do have to say – hearing them now say “Mom, remember when you did ……… for our bday party?” makes me happy that they even remember the antics that went on with trying to figure out how we can customize bday invites, scouring stores for some crazy theme item I decided in my imagination had to be out there somewhere and chasing down an appliance delivery truck to beg for two empty refrigerator boxes to make a gigantic fire truck for a 3 year olds bday firetruck themed party. I can still see their fathers face when he arrived home to see the red paint that I used on the driveway which I assured him I could clean up! The circus will inherit your creativity and always remember how fun you made her bday celebrations. You are a great mom!! You are an amazing mom, Lisa!!! A fire truck out of refrigerator boxes – that my friend, is just awesome!!! I hope my kiddo will have those same kind of memories! I can’t wait to see the invitation for the party. The Farm theme invitation is so cute. These are great party tips. Thanks for sharing.